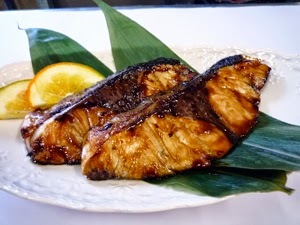 Buri (ぶり) or Japanese Yellow-tail is a very popular fish in Japan. The ocean caught are available from Autumn to early Winter and the farmed variety are available at grocery stores year round. The most popular dish using Buri is Buri Teriyaki and is remarkably easy to make. Hat tip to Setsuko Yoshizuka for emailing the recipe. Mix sake and soy sauce in a bowl and marinate fish for 5-10 minutes. Mix ingredients for sauce in a small bowl and set aside. Wipe the fish with paper towels. Heat some oil in a frying pan and fry fish until changes color. Wipe some excess oil in the frying pan with a paper towel. Pour the seasoning mixture over fish. Simmer on low heat for about 10 minutes, or until the liquid is almost gone.